An overworked teres major muscle or one that contains trigger points can mimic shoulder bursitis or a thoracic outlet syndrome. Common people that suffer are athletes like gymnasts, rock climbers, baseball players or rowers. Trigger points in your muscles can make them ache right at their location and at other, seemingly unrelated parts of your body. 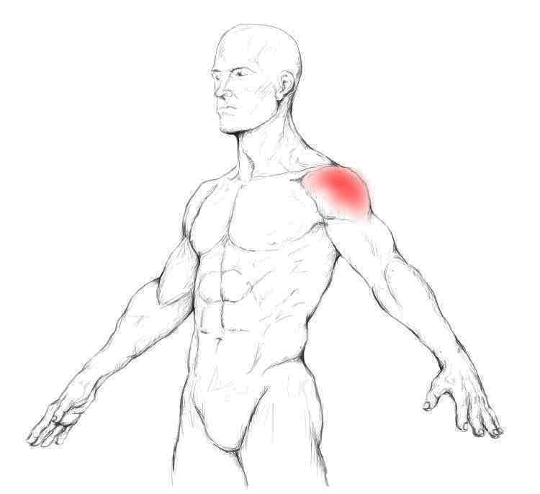 The main pain zone of the teres major is the back of your shoulder. 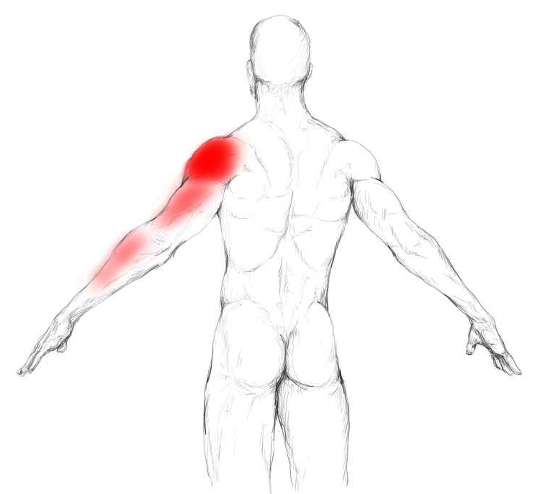 Beside that, pain can radiate to the front and side of your shoulder and down the backside of your arm. In the pictures below the red colour tells you how common it is to feel an ache in the highlighted area. The darker the colour, the likelier it is to feel pain in the respective spot when your teres major muscle contains trigger points. If this muscle is overworked, all movements that require lifting your arm to the side and in front of you may be impaired and/or painful. Because an overworked muscle usually is very tight and in a shortened position. 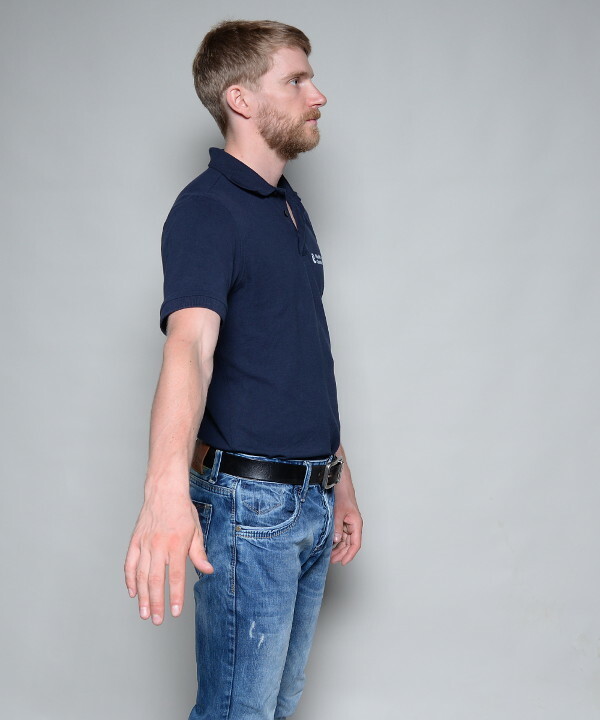 The movements mentioned above all include an elongation of the muscle as they display the opposite direction of the muscle functions. On the other side pulling on things – pulling on a blind to open it – may be also painful because the muscle has to work. Always remember: An overworked and tender muscle may give you trouble, no matter if you contract and thus “use” it, or if you stretch it. The teres major muscle attaches at the angulus inferior of the scapula and the tuberculum minus of the humerus. Those attachment points make it the little brother of the latissimus dorsi. The Xs in the picture below are areas where tender and trigger points are prone to develop in this muscle. The teres major muscle adducts the arm, extends the shoulder and rotates it inwardly. All activities where you have to adduct your arm forcefully will stress the teres major muscle a lot and thus are able to create problems if you overdo it or do not take sufficient rest. 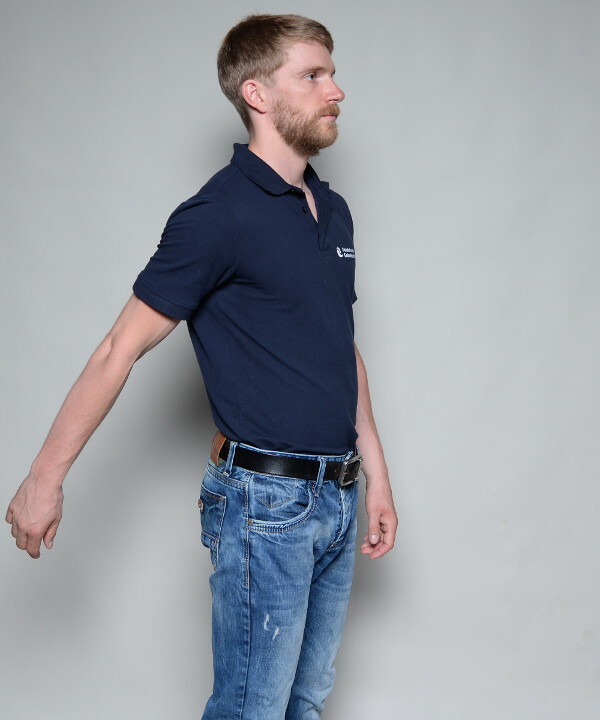 Here are some examples of movements where you have to pull your arms towards your body. Locating this muscle is not too hard. But separating it from the latissimus dorsi will be almost impossible for you as they are so close together. But this is not an issue at all. The teres major and the latissimus will develop problems from almost the same activities. So just massage the area of the teres major and do not bother if you catch the latissimus accidentally. I would not recommend massaging this muscle with your fingers – pinching and then rolling it -. It can be very tiring and over time you are likely to end up with tender muscles in your hand. A little bit is ok, but do not overdo it here. Instead I recommend using a massage ball. Let the affected side of your body face the wall. Then place the ball on the wall and press with the side of your body – at the height of your armpit – on the ball to get onto the teres major. Pay attention not to let the ball slide too much towards your rib cage. For now you do not want to massage those muscles. Now start the massage with slow and deep strokes. While massaging, you only want to work the painful spots. You can use the muscle picture for navigational issues. Whenever you hit a tender spot, stay there and work it a couple of times very precisely. Thank you for visiting my site. I hope it helps you!